Managing information using RSS is an important skill to learn however it is an area that people starting out struggle with. 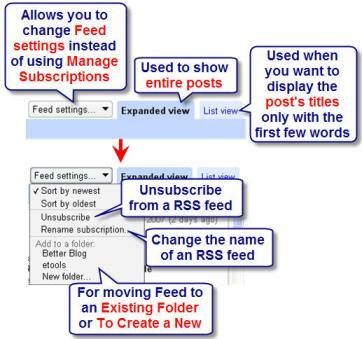 RSS (Really Simple Syndication) means that whenever new information is added to a site (e.g. your favourite blog) it comes to you instead of you having to continuously check the site. Read more about RSS here. My preferred way of managing information is iGoogle and Google Reader. This means all my email (via gmail) and RSS feeds e.g. blogs, Ning Communities, photos from my Flickr contacts all come to the one location, iGoogle, which I have set as my homepage in my web browser. 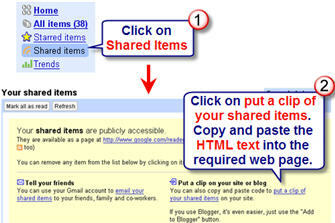 Learn how to set up iGoogle and Google Reader here. Reading blog posts using Google Reader is part of my daily routine — it is how I get my latest information on topics I want to read. Considering how much I use Google Reader I was surprised to realise that I had missed some key features which would help me be more effective using it — thanks Darren for telling us about your RSS Habits and inspiring me to also investigate how to get more out of Google Reader. How did I miss Trends? Must have been blind? Google Reader added this feature in January! Trend gives you a graphical and tabular overview of your blog reading habits which is useful for making changes to feeds e.g. delete blogs that are no longer post or those that you do not read much. I have not included my subscriptions summary (check out the top of Darren’s post and you will see his). Interesting point during my research of Google Reader trends — top bloggers subscribe and read a lot of blogs (check out Darren Rowse). As they say “Good Writer read a lot”. % Read is the number of posts from the feed that you have actually read as opposed to clicking on Mark as Read. Subscription trends indicate how many items are posted per day and also shows the % Read. More importantly the inactive tab shows the top feeds that are inactive i.e. hardly posting. 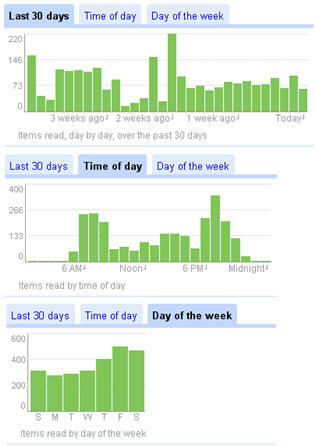 Items read is interesting because it shows your blog reading habit which can be displayed for the last 30 days, time of day or the day of week. As you can see I read most of mine in the early morning and evenings. I normally use Manage Subscriptions (bottom of Google Reader) to manage my feeds but it is quicker to make minor adjustments using Feed settings. I use rename a subscription when a RSS feed is unable to detect the name of the feed e.g. calls it Title Unknown or Blog. Folders in Google Reader are like folders on your computer. Some people like to create folders for the different types of blogs they read. My personal preference is not to use folders because folders slows down scanning of latest posts from my Google Reader Gadget on my iGoogle homepage. I do however use folders to add locate all my feeds from the same Ning community. John Larkin was nice enough to let me know that he uses Folders to create his blog roll for his blog. This means as he alters adds and deletes Feeds (i.e. blogs he reads) from Google Reader the changes are automatically displayed on his blog. Definitely a lot easier than inserting the links yourself. Added benefit to your readers is you grab his blogroll by saving as OPML and import into your own Google Reader. 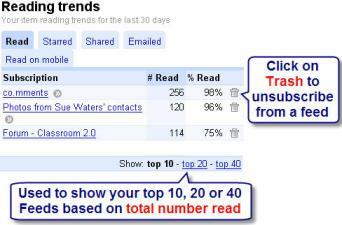 At the bottom of each post in Google Reader there is Add Star, Share or Add Tags which you can select. Starred items are posts that you highlight so that you can re-read later. 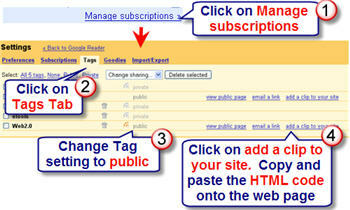 Tags are Google Readers way of bookmarking. I don’t use tags because my aim is to read through the posts quickly and I know that I can always search Google Reader using the Search option (top of Google Reader). However some people use tags to share specific categories (tag) with their readers. Check out the shared readers that Chris Duke uses on Muve Forward blog and EdTechatouille blog. What I had been missing in Manage Subscriptions was the Goodies — so I have now added a Subscribe as You Surf bookmark to my web browser. This means when I come across a new blog I want to subscribe to I just click on the bookmark and the blog is added to Google Reader. Always worth subscribing to your own blog post to make sure it looks okay in a Feed reader as this is how most your readers will view your posts. Here is my road test of other feed readers if you want to know about readers other than Google Reader. And don’t forget that blogging is not just about reading — it is also about conversations — here is how I manage my comments on other people’s blog posts. Quick Tips For Improving Screencasts! Thanks for another helpful post. Like you, I use iGoogle and Google Reader. You’ve pointed out several things that I had missed with Reader. Sometimes I think there’s just too much coming onstream too fast. None of us can keep up with it all, so we need posts like this to help us find the good stuff we’ve missed along the way. Excellent post! Google Reader is my preferred choice. I like the tagging feature as it allows you to treat tagged feeds as folders which can form the basis of a blogroll. I have created two blogrolls tagged friends and edublogs, obtained the code and added the blogrolls to my site. They dynamically update as you add and remove feeds in Reader. I intend to subdivide my edublog blogroll into more categories such as tech, K-12, tools, etc. That will come when I shift across to WordPress soon. I like the fact one can quickly preview Google Reader from within iGoogle. Hi Paul – I am glad the post was useful. Was totally amazed at the features I was missing. I did end up editing it this morning because I decided I needed to expanded on sharing items and sharing tags. Hi John – thanks for pointing out how you can use Google Reader to create a blog roll. Wow that is a much faster way of creating your blogroll than doing it manually. Will do another update to this post to let others know. Great post, Sue. I left it for you to get down and dirty into Reader’s hidden settings. Thanks Darren – although I am bound to have missed something when I did this review. 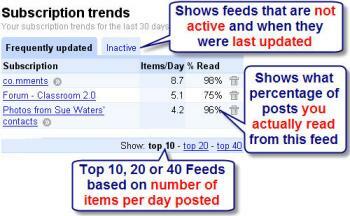 Interesting to note that most my readers use NetVibes and not Google Reader. I wonder if you can help me. I have been trying to add some edublogs to my google reader with my students but haven’t been successful. There seems to be a problem. I’m worried because I will be using it with my students. There are a lot of sites out there showing book video. BookVideoTV, BookTelevision and of course CSPAN, but I like how BN.com and Reader’s Entertainment TV have specific genre channels and original shows. There’s just more to see and I can be specific in what genre I’m interested in. Anyone else watch online tv? I use Google Reader myself and have bumped into, sometimes added some of their offerings. What I really like about your posts is the fresh look I get at some things I’ve seen but been unable to use. Going back to my Reader now to play around a bit more. I don’t want my reader to be on my blogroll however as it is mostly for parents of my students to read and I’m not sure all my links are suitable for that.